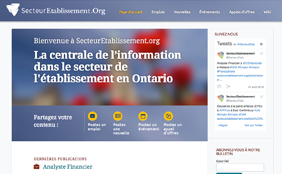 OCASI created SecteurEtablissement.Org in 2009, with funding from Immigration, Refugees and Citizenship Canada (IRCC). The goal of this site is to help French-speaking workers prepare to best serve their newcomer clients, and to help organizations support their staff who serve French-speaking clients. SecteurEtablissement.Org is divided into two parts, a French-language website providing time-sensitive information and a bilingual Wiki.